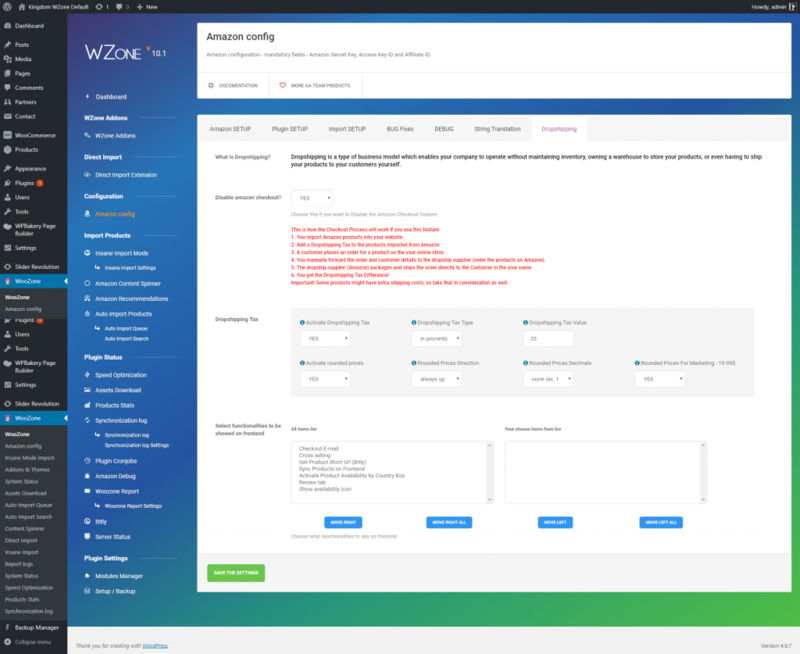 WZone comes with a NEW Outstanding Feature, Amazon Dropshipping! 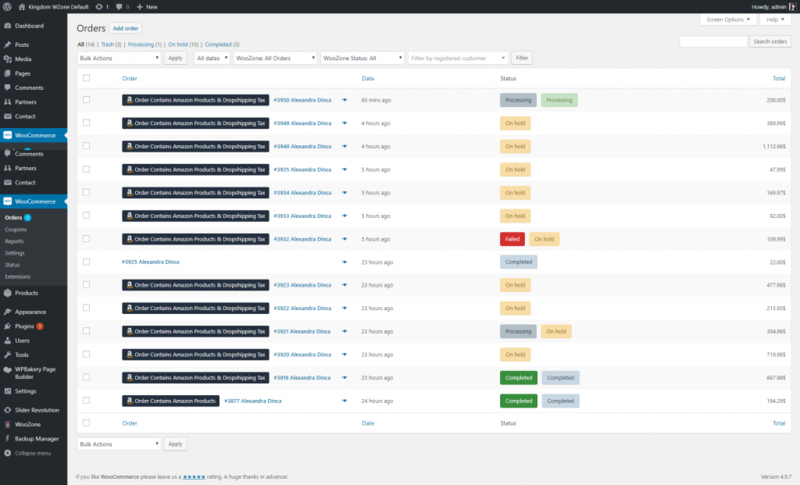 We have had many requests from our clients, and finally decided to develop a feature that does it & much more! Simply Import Products from Amazon into your Website, enable the Dropshipping option, Automatically add a Custom Tax (fixed or variable) on each product and Start Making Money! Dropshipping Businesses have a large number of Advantages. Normally, if you want to start a Business, it can be costly to acquire large inventory, a warehouse and let’s not speak about the shipping costs. Dropshipping offers an inexpensive way to acquire inventory which is not possible otherwise. 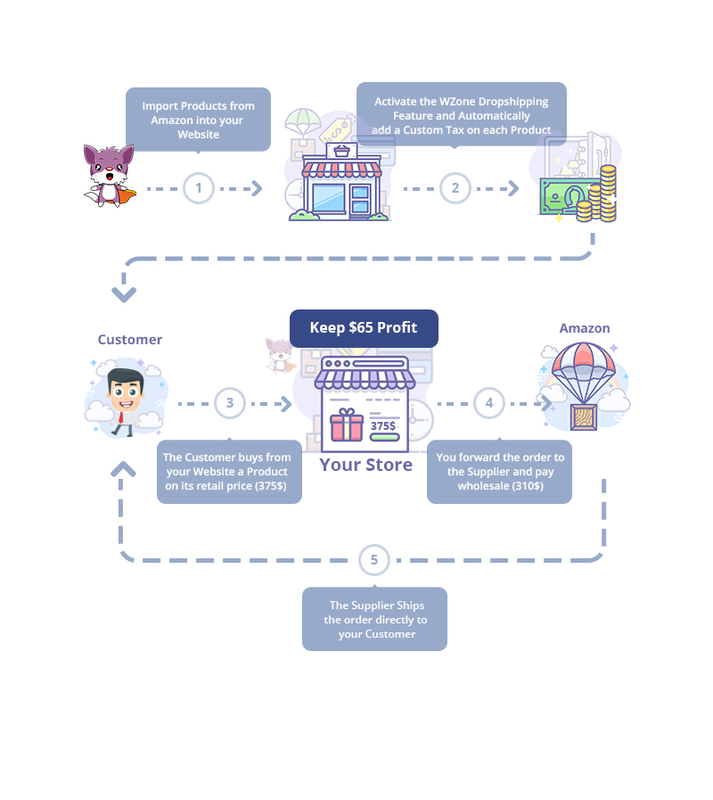 What are the Biggest Benefits of WZone Dropshipping? Save time and money! You do not need to maintain a warehouse, manage stock and care about the shipping. Products Diversity – easily switch merchandise if your products don’t convert! Flexible location – You can sell products from anywhere! Since the supplier does the shipping of the products! Visible results – Immediate profit! This type of business does not require much investment, and it can bring you profits up to 100%! The Amazon Dropshipping feature is very easy to use, from technical to visual point of view. Worried about mathematical calculations? Oh no, if I put a 10% tax on a 11.23 product what’s the profit for me?!!! Don’t worry about this! For each product that has dropshipping tax we automatically make some calculations and display the profit on the WooCommerce Products List / Details, Order List and Order Details! Also, you might encounter a situation where after adding the Dropshipping tax, the prices will look funny like – 17.31$, or they display too much digits – 17.31432$. We added some features that help you style the prices, so they look more appealing to your customers. Activate Rounded Prices For Marketing – Want to display prices on your website with more style? Like 19.99$, 23.99$ ? Simply enable this option. Wish to display the prices more customer friendly? Make them rounded? 12.7$ will become 13$ if you set it on going up or 12$ if it’s going down! Also you don’t need to worry about keeping track of what products to order for your customers on Amazon. On each order you will find the products availability, on what amazon website is available and also keep track of the products ordered on amazon, by giving them statuses like – New, Processing or Completed. Worried about prices changing on Amazon? Don’t worry, you can still sync Products with Amazon. Dropshipping, or allowing a third party to fulfil orders is allowed by Amazon as long as you comply with their requirements. Round Prices setup – style your prices.